For This Child I Prayed: here we go! Last Christmas I was already thinking about this Christmas, and couldn't wait to pick out Lael's first play kitchen! So, I decided I would take the plunge and commit to the idea. I didn't know exactly what it was, but I knew what it was going to become! 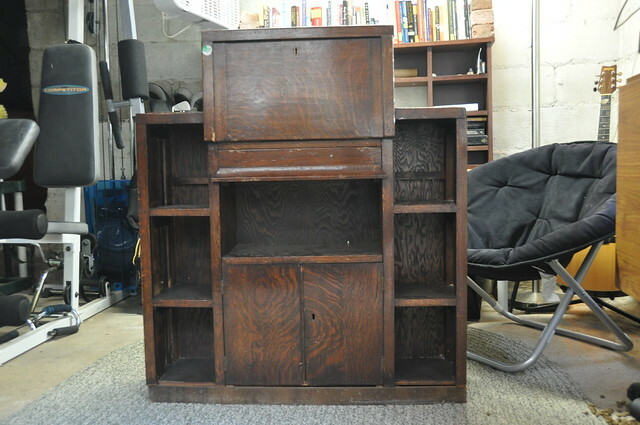 It was originally priced at $100, but we were able to get the shop owner down to $60! Come to find out, it was a handmade piece that was used as a secretary. Trey and I poked and prodded and brainstormed exactly what parts would be what and how we would dismantle it and put it back together to get our desired result. I really wanted something that had all of the wood parts that we needed. The thought of going out to Home Depot and buying wood, measuring it and cutting it just really stressed me out, so it helped ease my timid mind to know that all of the major structure was right here... just waiting to be rearranged. Please know that Trey and I have absolutely no idea what we're doing. Thankfully, he knows a whole heck of a lot more than I do about drills, saws, nails, and hammers. Nevertheless, we are both determined to make an ultra fabulous Christmas present for our girl and along the way spend some quality spouse time together in our little basement workshop. Or as he likes to call it, "The man cave". We love spending time together doing a project! So please follow along as we create our one-of-a-kind play kitchen for Lael, and Ruthie, too! Cute! 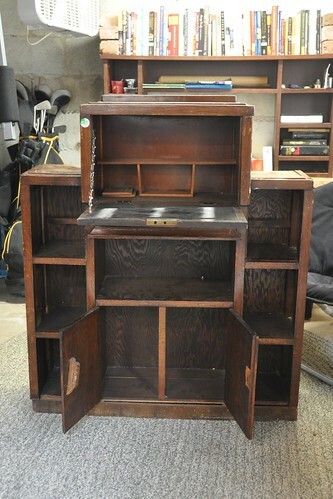 My dad is helping us make one out of an old entertainment center too for my Averly's Christmas present! I can't wait to see how y'alls turns out! I've been drooling over these too! I can't wait to see what you guys come up with!! Kelly, I don't know if you remember me -- I'm a friend of Trey's from camp. I've been following your blog and love all of your pictures. I can't wait to see how your kitchen turns out! You found such a great piece of furniture to start with. Our daughter will be 2 in February, and I'm thinking of making her a kitchen for her birthday. I'm hoping to pick up some ideas from you!